The Raging Grannies are awesome! Here is where Paul Ryan and Mitt Romney are going wrong. Ryan, with his budget plan that eventually will wipe out social security and medicare, assumes that the elderly now do not care since it won’t affect most of those over. You are so so so wrong, Ryan. 1987: The Raging Grannies were founded in Victoria, British Columbia by a group of peace activists who wanted to increase their effectiveness and impact. • To use street theater, humor, satire and props to get their message across. In 1995, the Seattle Raging Grannies started a-ragin’ in the United States. Gaggles continued to increase in number in Canada. 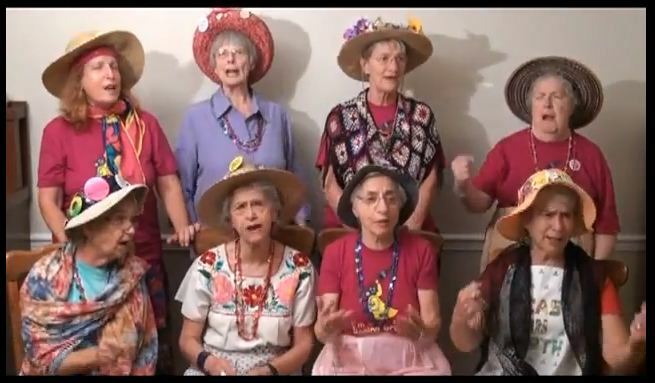 The Raging Grannies have several websites including one which is entirely songs. The ladies will take a tune that everyone knows and exchange their own words into the song. I have heard a few before, but this one is definitely worth pointing out and sharing. It is a minute and half short so make sure to watch until the end. I love it what I see the Raging Grannies do what they did at the end. Click here on SONG SITE to view more songs and lyrics. The Raging Grannies are also INTERNATIONAL! Check it out! Making enemies of women, the aged, the young, the poor. I have friends who are convinced that they’re intentionally throwing this one but I don’t agree. Regardless, if they don’t manage to steal it both these buffoons better kiss their political careers goodbye. Me, too. They’re great! Could you imagine being a kid and having one of them as your grandma? Of course, they may be totally different to family kids, but they may not.